"Featuring memory foam, microfiber fill, and a microfiber cover." Perhaps the best mattress topper on the market right now is the Sleep Innovations Gel Memory Foam 4-inch Dual Layer Mattress Topper. This unique product combines two popular mattress topper styles into one, resulting in a highly-rated, super comfortable bed pad. What's unique about this product is it combines a 2-inch gel memory foam layer underneath two inches of comfy quilted fiberfill. By combining these two materials, it delivers unparalleled comfort, as well as pressure-relieving support and temperature regulation. Plus, a machine-washable cover holds both layers in place, so you don't have to worry about allergens building up on the topper. Reviewers call the Sleep Innovations Mattress Topper the “best product ever,” writing that it helps reduce body aches thanks to its pressure point relief, all while providing a pillowy surface for you to sleep on. What’s not to love? If you don't have quite as much to spend on a mattress topper, another highly rated option is the Dreamfoam Bedding 2" Gel Swirl Memory Foam Topper. This product is made from gel memory foam, which provides several unique benefits to help you sleep better at night. This 2-inch mattress topper is made from gel-swirl memory foam, which provides ultimate pressure point relief by contouring to your body. Additionally, the gel infusion increases air circulation through the material, drawing heat away from your body to help regulate your temperature throughout the night. As an added bonus, this product is made in the USA and is manufactured without any harmful chemicals. According to reviewers, this mattress topper might just be a “miracle,” as it helps to reduce various aches and pains and is incredibly comfortable. Several note it works well in a variety of sleeping positions and does not have the unpleasant “off-gassing” scent that many memory foam products do. If you have allergies or simply don't like the idea of sleeping on a bed of real feathers, you can always invest in a mattress topper that's filled with a “down alternative.” These products are designed to have the same feel as a cushy down-filled pad, yet they're stuffed with other more humane and hypoallergenic materials. For a good down alternative, we recommend the Superior Microfiber All Season Down Alternative Mattress Topper. Featuring memory foam, microfiber fill, and a microfiber cover, this mattress topper is machine washable and comes in twin, full, queen, and king sizes. Customers who bought this topper have been mostly happy with their purchase. One said it adds extra cushion to their firm mattress but doesn’t sink like other soft toppers do. Another said it gave them the best night’s sleep they’ve had in a long time. In terms of negative experiences with it, a few reviewers said that after they washed it, the topper got lumpy. But most customers would recommend it to others. 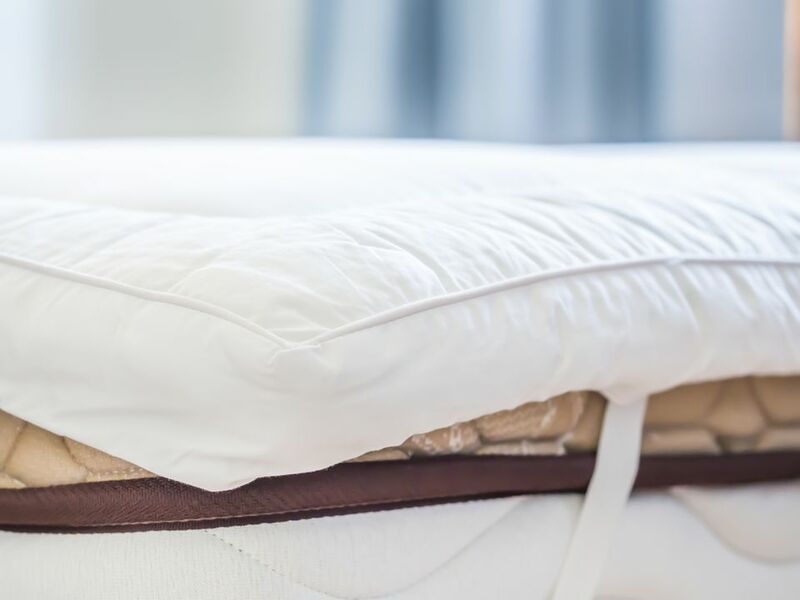 If you're sleeping on an old mattress, it may be causing you to experience back pain, but for many people, a new mattress simply isn't in the budget. You can help to relieve your nighttime aches and pains, however, with a product like the ViscoSoft 3 Inch Gel Memory Foam Mattress Topper. This high-density memory foam product is designed to keep your spine in proper alignment, helping to prevent pain throughout the night and in the morning. This mattress topper is 3 inches thick and made from gel-infused memory foam that contours to your body while you sleep, relieving pressure points while keeping your spine in an ergonomic position. Additionally, the gel helps to optimize airflow through the topper, letting your body heat escape so you won't get too warm. The topper comes with a hypoallergenic bamboo rayon cover that you can clean in the washing machine, and reviewers say this product is worth every penny, as it helps to reduce back pain while giving them a wonderful night of sleep. If you sleep on your side, a product like the LUCID LU20QQ30ZT 2" Lavender Foam Mattress Topper will help you get the most comfortable night's rest. This 2-inch scented memory foam mattress topper has five body zones to maximize comfort and support for this particular sleeping position. The LUCID mattress topper has textured zones that let your shoulders and hips sink into the mattress while you sleep on your side, reducing pressure to prevent tossing and turning. Additionally, it’s infused with a lavender scent that will help lull you off to sleep. Reviewers say the smell can be a bit strong at first, but overall, the foam is incredibly supportive and comfortable. The mattresses in college dorms are notoriously uncomfortable, but you can make them a little more cozy with a product like the Gel Memory Foam Topper. This 2-inch mattress topper is made from a gel memory foam, and it will make even the most uncomfortable mattresses feel high end. Memory foam provides pressure relief on key areas of the body by contouring to your shape, and the gel infusion helps to dissipate heat so you'll remain cool throughout the night. Additionally, this product comes in a twin extra large, which is the size of most dorm mattresses. Overall, this is a reasonably priced product with great reviews that would be perfect for college dorm beds. Many high-end bed products are filled with down—feathers from geese or ducks—and you can also find mattress toppers made from this luxury material. For instance, the Nottingham Home 2-Inch Gusset Featherbed Queen Mattress Topper is filled with duck feathers, providing a plush, temperature-regulating surface for you to sleep on. This 2-inch reversible mattress topper has a 100% cotton cover and is filled with down that provides an extra layer of comfort on top of your mattress. The cover has a baffle box construction that keeps the fill distributed evenly, and this product is good for both hot and cold sleepers, as it helps to regulate your temperature. Reviewers write that this mattress topper is incredibly comfortable, but several do note you may get poked by the occasional rogue feather. Another popular material for mattress toppers is bamboo, which is known to be soft, cooling, and environmentally friendly. If this appeals to you, you should look into the Mandarin Home Collection Plush Mattress Topper, which is crafted from natural rayon derived from bamboo plants. This product is made from a blend of microfiber and bamboo-based rayon, creating an incredibly soft, plush material that will regulate your body temperature throughout the night. It's filled with a hypoallergenic down alternative for a plush sleeping surface, and as an added bonus, it can be cleaned in the washing machine. The Mandarin Home Collection Mattress Topper gets consistently glowing reviews from people who say it’s a lifesaver when put on top of too-firm mattresses. People who sleep on their stomachs need a more firm mattress topper, as of this will prevent your shoulders and hips from sinking too far down. A great option if you are a stomach sleeper is the Pure Green 100% Natural Latex Mattress Topper, which provides extra-firm support and great breathability. This 2-inch topper is made from natural latex, which is known to be both breathable, cooling, and eco-friendly. This firm style is strong and supportive, yet still comfortable, making it the perfect for stomach sleepers. Many reviewers say this mattress topper is helpful in reducing back pain and provides the perfect amount of support. Our writers spent two hours researching the most popular mattress toppers on the market. Before making their final recommendations, they considered 15 different mattress toppers overall, screened options from 14 different brands and manufacturers, and read over 35 user reviews (both positive and negative). We bought three of our writer-recommended mattress toppers and had our reviewers test them nightly for two weeks. We asked our testers to consider the most important features when using these toppers, from thickness to overall comfort of the material. We’ve outlined the key takeaways here so that you, too, know what to look for when shopping. Thickness The thicker a mattress topper is, the more added cushion it will provide. Some thin options are 1-2” thick, and will do just fine if you simply want a little bit of added comfort on your bed. On the other hand, some mattress pads can be up to 6” thick — ideal if your bed is incredibly uncomfortable. Material Mattress toppers can be made with a variety of materials, including different types of foam, down feathers, and regular pillow material. There are pros and cons to the different options: For instance, memory foam often has an odor at first, while down toppers may lose feathers over time. Consider the positives and negatives of each material before making a decision. Temperature regulation Do you tend to get hot at night? Certain mattress toppers regulate body heat better than others, so consider this while shopping. Specifically, memory foam is known to retain heat, which can cause you to get too warm during the night, while down feathers are significantly better at maintaining a normal temperature. 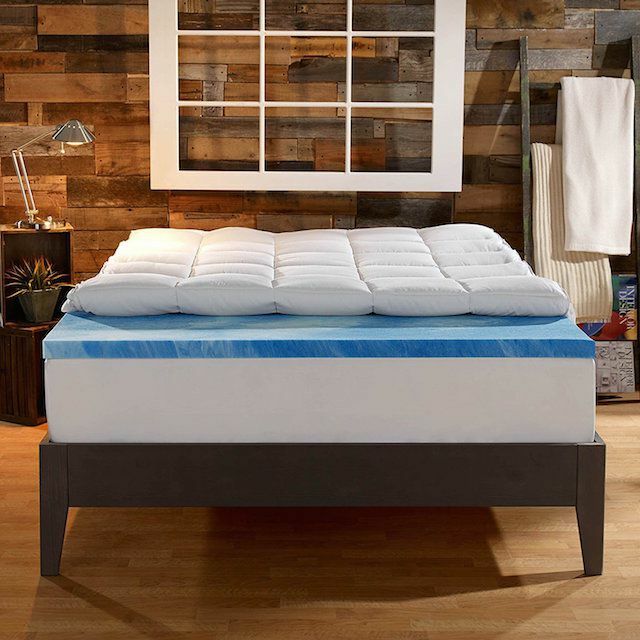 Our testers found the dual layers of this mattress topper to be extremely comfortable, with one reviewer comparing it to “sleeping on top of a marshmallow.” The topper also offered the perfect combination of support and coziness, according to our testers: “The feathertop part is soft while the memory foam part gives a little more support,” one of our reviewers explained. The fact that it bounced back after a night’s sleep and didn’t seem to be wearing down after extended use was another major plus for our testers. One of our reviewers simply wished that the memory foam layer didn’t hang over the bed, but mentioned that it wasn’t really noticeable once the sheets were on. If you’re looking for a memory foam topper, our testers thought this was a good option, particularly in terms of comfort. “It molds to my body so much more than my previous topper, which wasn't memory foam,” revealed one of our reviewers. However, one of our testers cautioned, “I do think it retains heat more, but that is pretty typical of memory foam.” One of our reviewers also noticed a strong smell, especially at first. In general, though, our testers liked the level of support it provided. “I love the thickness and the density of the foam,” one of our reviewers explained. If you’re looking for a lightweight cover for your mattress and not in need of tons of padding, our testers recommended this topper as a “convenient” option. According to our reviewers, it’s super easy to put on and take off because it doesn’t have pockets for the mattress. Another plus? “It doesn’t make you hot when sleeping,” one of our testers observed. On the other hand, one of our reviewers noted that if you move around a lot in your sleep, it will slip and need to be readjusted often. It’s also not the fullest topper for the long run. “It does not maintain its fluffiness,” one of our testers commented.